To limit the risk of CO buildup inside your home, never operate your generator indoors, in enclosed spaces like the basement or garage, or outdoors close to windows, doors or exhaust vents. Additionally, make sure you have working CO detectors installed on each level of your home, and test them regularly. 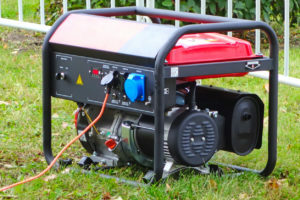 Minimize the danger of shocks or electrocution by setting up your generator on a dry surface, under a canopy-like cover to keep it out of the rain. And, never touch the device with wet hands. Only use the type of fuel recommended by your generator manufacturer, and check with your local fire department about limits on how much fuel you can store. Always use approved cans for fuel storage, and keep them outside your home in a sheltered, locked area. To safeguard against accidental fires, never store fuel near combustion appliances like a water heater or space heater. To prevent spilled fuel from igniting on your generator's hot engine, always shut off the unit and let it cool down before you refuel it. Never plug your generator into a wall outlet to power your home's electrical system. This dangerous practice called “backfeeding” puts your family, neighbors and area utility workers in danger of electrocution. If your generator is rated for 5,000 watts or more, have a licensed electrician install a transfer switch. This device lets you safely connect the generator to your home's electrical panel so you can power essentials like the refrigerator, lights and heating system. With a smaller generator, only use a three-prong, outdoor-rated, heavy duty extension cord. Additionally, choose a cord with a watt or amp rating equal to the combined loads of the items you plan to plug in. For more advice about generator safety, contact us at Hartman Brothers Heating & Air Conditioning.